It turns out I haven’t put any new screenshots on the front page since Dredmor v0.90. Considering we’re about to hit Dredmor v0.95 in the run up to release, something had to be done. Let’s get to it! Diggle Eggs? Good eating. And I’m getting some good use out of my Thaumite Infection wand to kill these guys. Okay, new character. Found some nice rings that give me holy and toxic damage attacks, have a cool hat, and ah: Black Powder! Note the downward stairs that I’m about to descend. 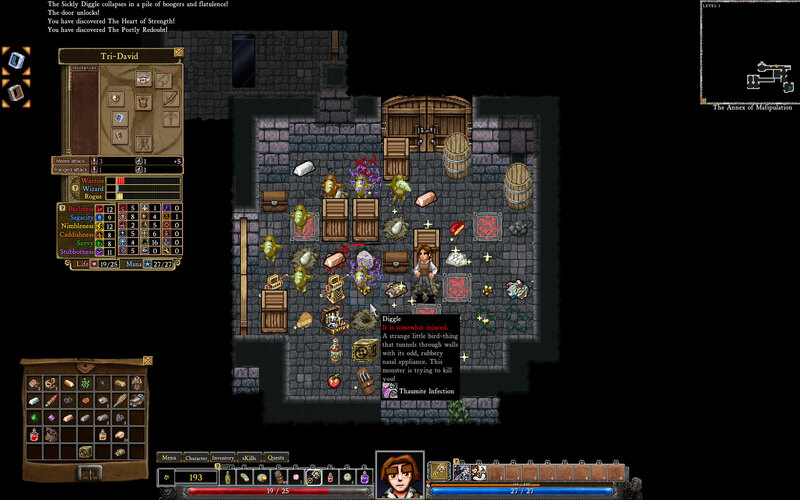 I went down a dungeon level and the second room I find is completely crammed with monsters. I’ve found something useful to do with that black powder I found just a moment ago. 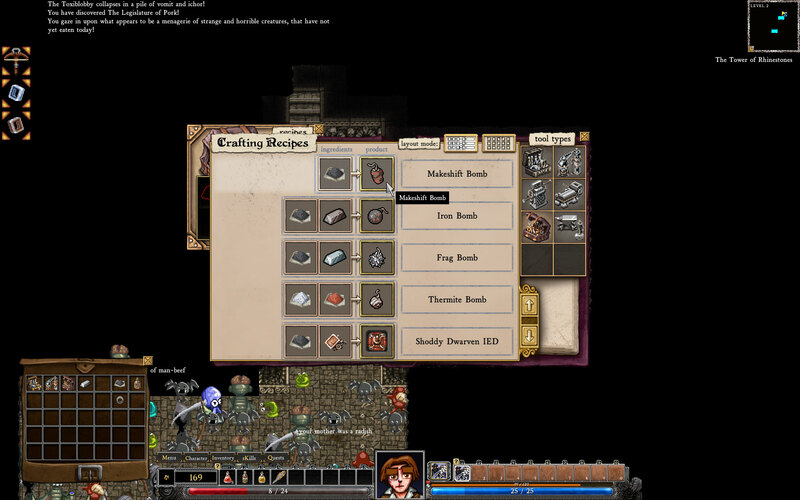 Unfortunately I don’t actually have a good tinkerer skill at all, so I can only make one bomb. This proves completely insufficient in stemming the tide of hostiles. Here I made a magic character to show off some spell effects. That poor Sickly Diggle just stepped on my Rune of Exploding and set fire to everything around, especially itself. The spellcaster was going pretty well – I was (ineptly) dual-wielding a magic staff and a magic sword but then was undone by my own hubris when I got sloppy with a Thaumite Infection wand and ended up infecting myself. It’s probably a terrible way to die. Oh, if you have any questions about what is going on in any of these shots feel quite free to ask them. Only real question is about the skills. Do the skill points just unlock new skills or are they also used to upgrade ones you have already? I saw that the Vampire line only had three skills shown, so was curious if those were some pretty impressive skills to be the extent of Being a non sparkly Vampire. Also, if a Vampire Uses armor from a glitter smith and starts sparkling, does it get killed instantly, just on principle? Each skill point – you gain one per level – unlocks a skill in the tree given to you by your initial skill picks. 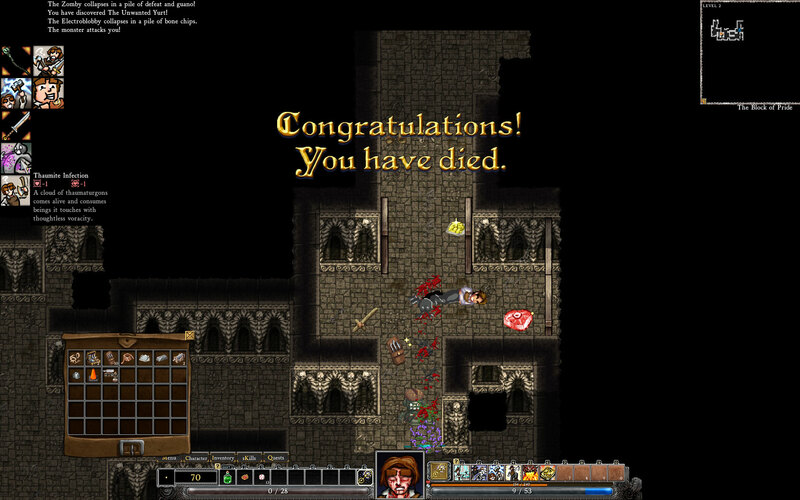 For instance, if you choose vampirism, and you get a skill point, you can unlock the Corpse Drinking skill. If, however, you did not pick vampirism as one of your Starting Seven, you can never access those skills. Some trees are shorter than others. We’re… leaving room for expansion, shall we say. Ahh, makes sense then. Expansions are always good! The screenshots are fantastic. Every really looks great! Quick question: in DoD levels will be permanent, or one can always go back and kill more monsters to gain more exp when things get too dangerous? In other words will this be a ‘hack or a ‘band roguelike? Levels will indeed be permanent for each character. 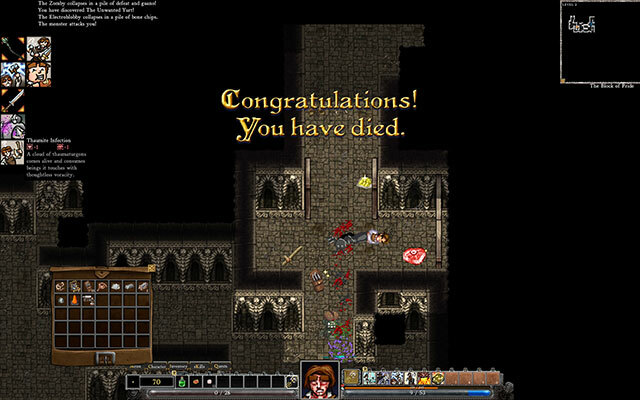 That is, there is only one level 0 (“The Dungeon”) which you can clear out completely or breeze past for now and return to later. The way levels currently play, I don’t expect that anyone needs to clear them out completely to be prepared for lower levels, unless it’s really hard or they’re a completionist. We did an Important Company Meeting today, and … vague answer is that there should be some (more) opening up of beta testing occurring in about a week. Ish. Or something. This is a vague answer, remember. The details of testing will be handled by our own Citizen Dan, who should make another appearance on here sooner or later… so for now the place to go is the beta email list in the sidebar on the right of this page. We haven’t sent anything out yet but ought to be doing so soon. Ish. I also noticed there is no careers link. There totally should be. That assumes we have money to pay people. As it is, we’re down to our last can of beans. which tree is the shortest for skills? What sort of work are you interested in? And are you local to the British Columbia/Pacific Northwest? No :(, I’m actually in Western Massachusetts, Greenfield specifically. Thats in the New England area of the US, northeast. I did networking engineering / helpdesk and server/routing management as a network admin from 2004 to 2009 while I served in the Marine Corps, I’ve always been stuck to anything technical, from my first Atari and NES and then our first computer when I was little (a 486 with win 3.11 for workgroups) and I was learning to tweak the hell out of it at like 11. Games and virtual entertainment have always been a big part of my life. Its just that much more of a slap in the face that I got no civilian certifications from the military and aside from networking and hardware skills, I have no modeling / sprite computer graphics expertise or Code Fu (programming skills). Or Nunchaku skills. In other words, it was more or less a desperate leap that maybe I could find something, somewhere, and learn something more about the industry that really holds my heart. It’s me again, your favorite user interface mocker. Please implement a way to let me know how many skills (to be precise: rows of skills) there are without clicking the scrubber/scrolling to one end. That’s what modern operating systems use scrollbars for, you know? Not only to have something the users can click on but furthermore to indicate how much content can’t be seen from the current view. Your slight redesign on the crafting screen was a welcome idea for that since you were able to categorize those things a bit. You should however come up with a slightly different approach for skills in case your users are wondering how many rows there are. / On second view I realize that a button on the scrubber is grayed out if it’s not usable right now. That does not indicate how much of the content is out of sight right now. … more generally, Dredmor’s scrollbar “engine” (which is really me writing a lot of custom code) doesn’t really do general sized thumbs. I suppose we could put something in there… hmm, I’ll bug David about it in the morning. Still, if Nicholas is up to making the scrolling a more happy experience, I’m game for it as well. We’ll talk it over. I’m excited I so cannot wait for DoD; it looks like the kind of game Linux could use. Good work you guys! Does the little face cringe and squint whenever he gets hit? Hey there, first of all I’d like to congratulate you for creating this awesome-looking game, and wish you good luck for the betterment of the game. I am certainly looking forward to buying it when it’s released if it’s not too expensive. But now for the questions: when we die, is our character reset? Do we lose items/money/skills? Do you plan on having a way to reset our skills and get our skill points back? Where do we spawn when we die? Can we, after dying, load the last save file? Will it be multiplayer? Will there be any kind of NPC apart from the mobs? Can we teleport within a dungeon? If not, please make it so! It’d open so much space to tactics, especially for boss killing. I know the game is only BETA and you probably hadn’t thought of all the questions, but please give us some insight and tell us what you plan it to be, even if it’s far from what it turns out to be, I’d appreciate that! 1. When you die, your character is permanently dead if you choose the permadeath option. Otherwise you are free to reload a game from a previously saved point. 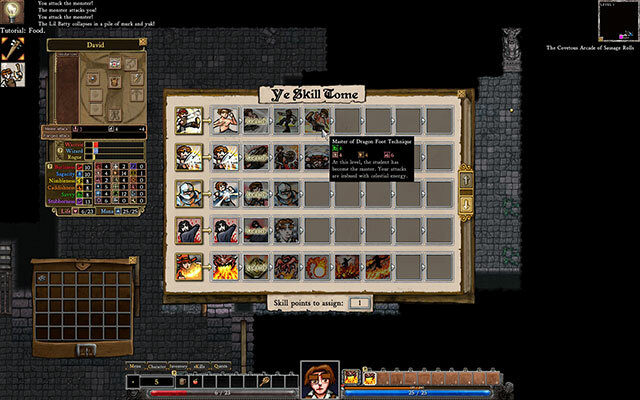 The game is autosaved when you enter a new dungeon level. 2. No multiplayer. This was built from the ground up as a singleplayer game, the roguelike mechanics do not support multiplayer, and that’s a whole can of worms we’re not going to mess with for our first game. 4. 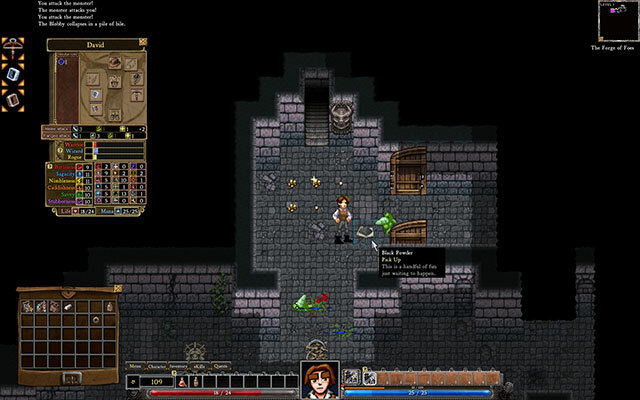 There are a few teleportation spells/skills as well as teleporter pads in the dungeon. I’ve been playing the game for a few days now and I’m hooked, I’m mostly playing a warrior type with viking-magic and smithing, but something has been bothering me. What exactly does the Lutfisk God do? Outside of getting sacrificed to, since this is a roguelike, I assume he has some kind of purpose. An answer to this riddle would be greatly appreciated. Well, if you offer around 250 or more lutefisks. you get an unique item (artifact). Sort of similair to the uberchest items. That gradation. sure if it does or not and i really want this. an answer to this would be greatly appreciated. Why does the player character have such large, rectangular eyebrows? I find them abhorrent. Wow, this looks totally awesome. 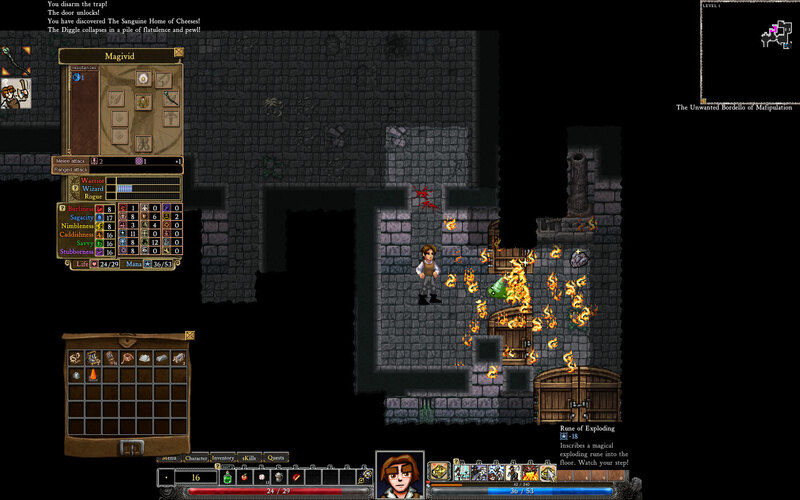 Have you bookmarked and will hopefully pick the game up on Desura next week, as soon as I get my next paycheck. I never get tired of DoD ^^ Have already gifted it to four friends… and it never fails!